A wrought iron railing is a beautiful addition to any residential or commercial staircase. Whether the design is simple or elaborate, wrought iron can beautifully accent a space, displaying both strength and elegance. In December we shared some of our favorite wrought iron railings. Today, we discuss the process of designing and constructing an ornamental metal handrail system. We also explain the benefits of incorporating wrought iron stair railings into your residential and commercial projects. What is wrought iron handrail? Custom products available for interior and exterior settings, wrought iron handrail systems are designed to truly make a statement. With designs ranging from clean, simple lines to intricate scrolled patterns, these hand-welded ornamental metal systems are truly impactful. Whether a client is seeking a geometric style or Tuscan elegance, the custom options are endless. Each of our wrought iron handrail systems is powder-coated, a finish far superior to less expensive painted products. Coated to withstand the test of time, our premium wrought iron railings are available in both smooth and hammered finishes. How is a wrought iron handrail made? The construction of a wrought iron handrail system takes place in our state-of-the-art metal fabrication facility. Hand-forged by our team of skilled artisan welders, each handrail system is not only functional and safe, but a true work of art as well. Our team of old-world craftsmen forges the metal and typically pre-fits the wrought iron railings to each staircase prior to delivery. The pre-fit process serves to ensure a flawless fit and finish while reducing the need for messy welding at the job site. What wrought iron style will complement your space? When designing a home or commercial space, there are many factors to take into account. In your quest for inspiration, you may find yourself considering these questions. Are you trying to bring your client’s inspiration to life? 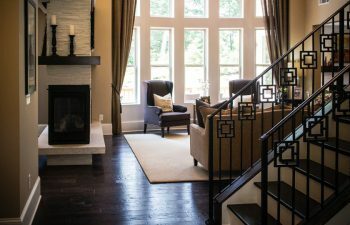 Are you designing the perfect stair to fit your client’s ideal design? How do you meet the needs of the space your client envisions? If you are looking for a distinguished staircase system for an upcoming residential or commercial project, look no further. Wrought iron handrail is an excellent option, a timeless and beautiful choice that also provides ultimate safety. Versatile, with many different style options, wrought iron stair railings can perfectly accent any space – from traditional to modern. Ornamental metal design is available to satisfy all customer needs, and beautiful wrought iron stair railings can be custom designed for both straight and curved staircases. Guaranteed to create a unique and everlasting look, wrought iron will ensure your residential or commercial clients are satisfied for years to come. Visit our wrought iron handrail project gallery for additional details and pictures on our exquisite projects. From inspiration to installation our team is committed to designing and building the highest quality custom stairs. Our reputation speaks for itself and client satisfaction is our highest priority. Contact us today to discuss your next wrought iron handrail project.